Colorado is expected to join an interstate agreement that would give an Electoral College majority to any candidate who won the national popular vote. When Donald Trump won the presidency in 2016, it was the fourth time in American history — and the second time this century — that a candidate won the Electoral College but lost the popular vote. Now a group of voting-rights activists is working to prevent any future presidents from taking office the same way. The National Popular Vote initiative seeks to set up an interstate compact that would effectively do an end run around the Electoral College without actually abolishing it, which would require the lengthy, laborious process of building broad, bipartisan support to pass a constitutional amendment. The logic behind the compact is that the Constitution already gives states the power to award their electoral votes how they see fit, so each state that signs on to the compact agrees to award its electoral votes to whoever wins the national popular vote — not necessarily the candidate who wins that state. There’s just one catch: The agreement only goes into effect when the states who’ve joined are worth a total of 270 electoral votes — enough to deliver an automatic victory to the popular vote winner. Currently, 11 states (plus the District of Columbia) representing 172 electoral votes have signed on to the compact, but Colorado and its nine electoral votes are primed to join in the next few weeks. (The state House and Senate recently passed the bill, and Gov. Jared Polis has said he will sign it.) That would bring the total number of signatories to 13 and the electoral-vote count up to 181 — two-thirds of the way to 270. Now the compact just needs to bring on enough new states to get 89 additional electoral votes and it would radically change how the U.S. picks its president. The million dollar question is, could it really happen? For the last few years, it has looked impossible. The compact had passed in 12 places, yes, but all of them were solidly blue — before the 2018 midterms, all of them were at least 11 points more Democratic-leaning than the country as a whole.1 What’s more, supporters had almost run out of low-hanging fruit to target; only one other state that blue (Delaware) has yet to sign on, and it is worth only three electoral votes. It seemed like the National Popular Vote campaign had hit a ceiling. Red states were (and still are) unlikely to join, given that both times the popular vote and electoral vote split in living memory — in 2000 and 2016 — the outcome favored the Republican candidate.2 And purple states theoretically have little incentive to sign on; every four years, presidential candidates shower them with a disproportionate share of their attention (campaign visits, media buys) in an effort to snag some of those precious few swingable electoral votes. That would all go away if the only thing that mattered was the nationwide popular vote. So if we assume that these bills will only pass in states where Democrats can push them through without GOP support, what other states might join the compact in the next few years, and would those states be enough to reach 270? New Mexico, where the compact has already passed the state House, looks like the most likely next signatory, which would add five electoral votes. After that, there will be four remaining states that have not yet signed on and where Democrats have full control of state government: Delaware, Maine, Nevada and Oregon, which would contribute a total of 20 more electoral votes. (All four states are considering bills that would have them join the agreement.) In addition, Democrats have a good chance to take full control of Virginia’s state government after this fall’s legislative elections, which could add another 13 electoral votes. But even if all these states pass a National Popular Vote bill, the compact would still sit at 219 electoral votes — 51 shy of the number needed for it to take effect. Democrats would then need to take full control of several more states for the compact to become a reality. And even if the party accomplishes that difficult task, it’s not safe to assume that those states will automatically join the agreement; Delaware and Oregon have had Democratic-controlled governments for years and still have not joined (the campaign to ratify the compact kicked off in 2006). Opposition to the effort will likely ramp up, too, if the compact begins to look like a serious possibility. Right now, if the compact has any chance of being realized, it likely won’t be for many years. Ultimately, the biggest challenge to the National Popular Vote agreement may be a legal one. Election-law expert Rick Hasen at the University of California, Irvine School of Law told FiveThirtyEight he expected there would be serious legal challenges to the compact if it crosses the 270-elector threshold. Opponents may brandish the part of the Constitution that says that interstate compacts require the consent of Congress, or they may argue that it runs afoul of the Voting Rights Act because it may diminish the clout of minority voters. And, of course, there is the fact that it circumvents what the founders intended — the Electoral College was designed to be an indirect method of electing the president. So even if organizers somehow get states worth 270 electoral votes to join the compact, expect it to face a long fight in the courts challenging whether it can actually take effect. 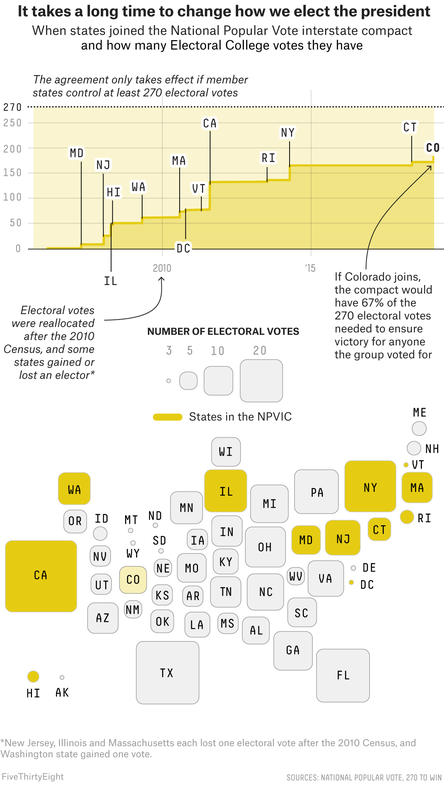 CORRECTION (March 5, 2019, 1:07 p.m.): A previous version of the cartogram in this article mistakenly failed to identify Connecticut as part of the National Popular Vote initiative. According to FiveThirtyEight’s partisan lean metric, which is the average difference between how a state votes and how the country votes overall, where 2016 presidential election results are weighted 50 percent, 2012 presidential election results are weighted 25 percent and results from elections for the state legislature are weighted 25 percent. That isn’t necessarily rational, by the way, since which party the Electoral College benefits can switch around from year to year. In 2008 and 2012, for example, it benefited Democrats. In Hawaii, the Republican governor vetoed the bill, but the Democratic legislature overrode her. And when New York signed on, it was technically under a divided government, but only because a breakaway group of Democrats was siding with the GOP in the state Senate; Democrats still had a numerical advantage in the chamber.